A painting of the Battle of Veracruz. 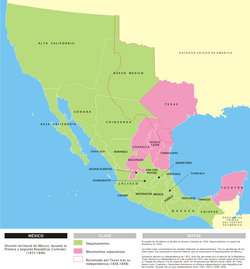 The Mexican–American War took place between 1846 and 1848 between United States and Mexico. When Mexico got independence from Spain in 1821, Texas was part of Mexico. Americans and other settlers came into Texas when Mexico allowed non-Spanish settlers to settle there. After many settlers came to Texas, disputes led to the Texas Revolution in which 1836 Texas became independent. Mexico refused to recognize the republic of Texas, as an independent country. Texas soon asked to become a state of the United States. The United States moved quickly to annex Texas after the 1844 election of James K. Polk. In his campaign, Polk had called for the "re-annexation" of Texas and the "re-occupation" of the Oregon Territory. Polk also wanted California and the rest of what is now the Southwestern United States. In 1845, the US annexed Texas. But Mexico still did not recognize its independence or recognize the annexation by the U.S. The United States offered to buy from Mexico the land extending from Texas to the Pacific Ocean, but Mexico wanted to keep that vast area. In 1846, a dispute over the border between Texas and Mexico resulted in armed conflict, and the Mexican–American War began. After offering to buy the territory, Polk moved U.S. troops into a place that Mexico said was not in Texas, but rather part of the Mexican state of Coahuila. The Mexican army attacked them. The main causes of the war was the westward expansion of the United States]]. All through the 19th century Americans believed it was their right to expand westward. At the time they believed they could conquer the people already living on the land and take it for the United States. Southerners wanted to see more slave states. Antonio López de Santa Anna became President again. Many Mexicans hated him and did not want to follow him into war. Many Americans, including young Abraham Lincoln, also disliked the war. ↑ "US–Mexican War, 1846–1848". PBS/KERA. Retrieved 13 November 2016. ↑ 2.0 2.1 "The Borderlands". U.S.-Mexican War. PBS/KERA. Retrieved 29 August 2016. ↑ 3.0 3.1 3.2 3.3 3.4 "Mexican-American War". History. A&E Television Networks, LLC. Retrieved 29 August 2016. ↑ 4.0 4.1 "Timeline of Major Events". 1848 Mexican-American War. University of Michigan. Retrieved 29 August 2016. ↑ 5.0 5.1 5.2 5.3 "Mexican-American War, An Investigation Utilizing the Just-War Theory". Mount Holyoke College. Retrieved 29 August 2016.